The Wildlife and National Parks Department (Perhilitan) had successfully busted several syndicates involving the buying and selling of wildlife online as well as hunting wildlife without any licenses. 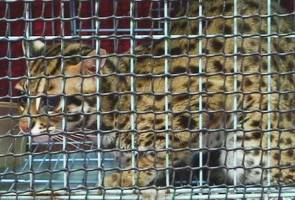 CHERAS: The Wildlife and National Parks Department (Perhilitan) had successfully busted several syndicates involving the buying and selling of wildlife online as well as hunting wildlife without licenses. Natural Resources and Environment Minister Datuk Seri Dr Wan Junaidi Tuanku Jaafar said 11 individuals were nabbed and 50 wildlife species worth of RM75, 000 were rescued. "In the raid on March 27, seven people were arrested, for being a major supplier of wildlife, who are active in making online transactions selling wildlife illegally. “The Wildlife Department has been monitoring their activities for a long time and we believe we have managed to break the main syndicate involved in exploiting the social media for illegal wildlife trading in Peninsular Malaysia,” he said in a press conference, here, today. He explained that 10 cases of smuggling and sales of wildlife using buses as a mode of transportation, was detected since the last four years. He added that the wildlife buyers range from college students to children from rich families who keep the wild animals as pets and as a hobby. Wan Junaidi said the department also detained four individuals on March 29, for hunting wildlife without any licenses. "The ministry is giving a strict warning to anyone who sells, keeps or owns wildlife without permission from the department, to stop doing so immediately or face legal action," he said. Among the wildlife which were rescued include leaf monkeys, Asian palm civets, Asiatic leopard cats, Indian Star tortoise, and hill myna birds. Let's Talk: Can We Afford Wildlife Conservation?